Chakra is an ancient Sanskrit word that means "wheel of light". In metaphysical terms, a Chakra (pronounced sha-kra, or cha-kra) is an energy center, or spinning wheel of qi (prounced chee) energy that, when healthy and vibrant, provides optimal support for our emotional, mental, spiritual and physical bodies. Located just outside of our physical bodies in our auras, or auric fields, the Chakras may not be easily visible to the naked eye, though many gifted healers can see our Chakra colors. To view Chakra Gemstone products, go to the Products page and click on the appropriate link. Our bodies encompass hundreds of Chakras with varying colors. Many of my jewelry creations focus on the seven primary Chakras that run vertically along our spinal column, starting at the bottom (near the tailbone) and proceeding upward toward the crown of the head. 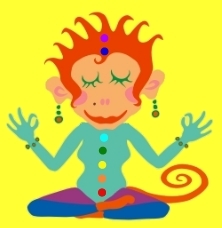 See Chakra Monkey to the right for an illustration of this! These seven chakras are closely tied to our emotional and spiritual bodies. When out of balance individually or collectively, they can greatly affect our physical health, and our overall sense of wellbeing. Chakras can easily be brought back into balance through the use of colors. Like all living and stationary things as well as our thoughts, COLORS VIBRATE ... each one holding its own unique vibrational frequency. Just looking at the colors that correspond to each out-of-balance Chakra can help bring it back into alignment. Imagine how wearing certain colors of clothing or jewelry can enhance your energy! The seven primary Chakras start at the base of the body continuing upward, and include the Root (1st), Sacral (2nd), Solar Plexus (3rd), Heart (4th), Throat (5th), Third Eye (6th), and Crown (7th) Chakras. Color: Red. Location: Base of spine. Physical: Kidneys and bladder, vertebral column, hips and legs, adrenals. Emotional: Grounds spirit force in body. Survival instincts. Security. Helps one work lovingly on physical plane. Attributes: Red gemstones (ex: Garnet) resonate with the base and sacral chakras and the planet Mars, energizing and initiating action, heightening libido and stimulating creativity. Traditionally red stones have been used to treat hemorrhages and inflammation. Color: Orange. Location: Lower abdomen. Physical: Uterus, large bowel, prostate, ovaries & testes. Emotional: Emotions, sensuality, high soul procreation. Directs self toward devotion. Brings joy. Attributes: The color of vitality, orange gemstones (ex: Carnelian) resonate with the life force ... the sun. Excellent for stimulating creativity and assertiveness, they have a vibrant yet grounding energy that gets things done. Color: Yellow. Location: Above the navel. Physical: Liver, spleen, stomach, small intestine, assimilation, digestion, pancreas. Emotional: Personal energy and power, will, energy, metabolism, self-esteem, happiness. Attributes: Yellow gemstones (ex: Yellow Jade) work with the solar plexus and the mind, balancing emotion and intellect. Traditionally they were used to cure biliousness, jaundice, and other diseases of the liver, and are excellent for reducing seasonal depression, bringing the warmth of the sun into winter. Gold stones have long been associated with wealth and abundance. Yellow crystals resonate with intellectual planet Mercury; both yellow and gold crystals resonate with the Sun. Color: Green and Pink. Location: Center of chest close to the heart. Physical: Heart and breasts, thymus gland. Emotional: Love and relationships, understanding and trust, compassion, balance, forgiveness; releases emotionally suppressed trauma; soul/heart consciousness. Attributes: Green gemstones (ex: Green Jade and Rose Quartz) resonate with the heart chakra and the planet Venus, providing emotional healing and instilling compassion. Traditionally, green gemstones have relieved diseases of the eyes and have improved vision, as the color mimicks nature and soothes tired eyes. Color: Blue. Location: Throat. Physical: Throat and lungs, thyroid gland. Emotional: Communication, sound, vibration, self-expression, listening, speaking, writing and creativity; expressing truth through power of the spoken word. Attributes: Green-blue and turquoise-colored crystals (ex: Blue Turquoise) resonate with higher levels of being. They stimulate spiritual awareness and metaphysical abilities. Many turquoise stones connect to cosmic consciousness, drawing it down to earth, as well as instill profound peace and relaxation. Blue stones resonate with the throat chakra and support self-expression. Color: Indigo. Location: Center of the brow (forehead). Physical: Eyes, lower head and sinuses, pituitary gland. Emotional: Intuition/psychic abilities, telepathy, connection to higher self, imagination, balanced state of mind; sees divine perfection in all things. Attributes: Indigo gemstones (ex: Lapis Lazuli) link to the highest states of consciousness and to the depths of space. Stimulating intuition and metaphysical abilities, they bring about a mystical perception of the world when placed at the third eye and cohere spiritual identity at the crown chakra. Color: Violet. Location: At the crown (top of the head). Physical: Brain. Pineal Gland. Emotional: Universal Consciousness. All-Knowing. Understanding. Enlightenment. Peace. Personal understanding with Infinite Oneness with God. Gateway to other Dimensions. Attributes: Purple gemstones (ex: Amethyst) resonate with the crown and higher crown chakras, the planet Jupiter, and multidimensional realities, drawing spiritual energy into the physical plane, and encouraging service to others.